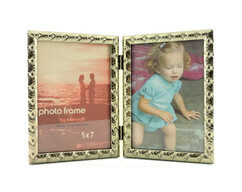 A simple, clean 1960s hinged double 5x7 photo frame in bright gold tone. 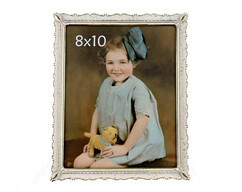 Wonderful vintage condition with normal wear. No visible rusting or adverse metal deterioration of any type. The backing does show some age-related wear and fading. Original 97-cent Gibson Department Store price label affixed to backside. Unpackaged weight is 1 pound. 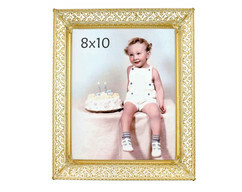 Frame overall measures approximately 10 3/8 inches wide across the front by 7 1/8 inches tall.